LG, the South Korean giant has been out of the game for a while, when it comes to the affordable range of handset, I mean they have launched handset in 10K-15K pricing last year, but they weren’t compelling to audience in any sense. While we are yet to see announcement of its flagship smartphone, the G5, in India yet, the company seems to finally take entry and mid-level segment seriously with the launch of its new K Series handsets, the K10 LTE & K7 LTE. The brand has launched its two new LTE enabled smartphones to cater the need of youth consumers, who are looking for a stylish and decently powerful smartphone in the sub Rs 15K price bracket. Before today’s launch we had these devices, so we spent a lot of time to test out its features and what they have to offer. Though in this post you’ll be reading about the K10 LTE smartphone only, for K7 LTE smartphone, we have a separate review for you to read. Let’s dive in shall we. This is probably the most stylish mid-ranger LG has ever produced; the K10 offers an attractive looking handset that has a removable back panel, unlike many mobile brands, which are going for the unibody designs. The device feels sturdy and measures 140 gram with 8.8mm thickness. Now that is a lot of thickness, but that only gives it a solid feel like the frame/edges you see have metal construction. You’ll be familiar with overall design language as it reminisces the G4, G3 and other LG’s handset launched in past two years. Even after taking the bold move for the G5 with semi-modular design the brand is still fond of their old design, which houses volume and power keys on the rear side of the device. Coming to the rear part, just above the buttons setup, it has a camera module and alongside is the LED Flash for support. On the bottom part, you’ll see a loudspeaker, which is quite powerful I must say. All in all, it’s a nicely design handset that should keep you invested if you’re also fond of living in LG’s good old times. The real estate on this handset is at 5.3-inch, which is an IPS (In-Plane Switch) panel and has a resolution of 720p. Thus, the pixel density on this screen is at 277 PPI (Pixel Per Inch). There is a 2.5D arc glass on display, which not only for better protection but also offers smooth touch operations. You won’t have much fun watching movies on this handset, but a casual watch time of YouTube videos can be done at 720p. The sunlight legibility on this display isn’t favorable, but after increasing the brightness level to high, one would be able to see partial content. The screen isn’t fingerprint magnet, which is one of the positive points we can say about it. The LG handsets aren’t quite known for their custom launcher experience; I haven’t been fond of them either. Except for the flagship devices, where you’ll see certain extra features catering the need of premium users. But this time around, LG has tried to bring such features to their latest mid-range K Series smartphones. The custom launcher is based on the Android Lollipop 5.1, which is not the latest version of the Android OS, but it would be fine. As rather much won’t change regarding the UX experience. Talking about the experience, it offered smooth navigation between apps and settings options. Overall, we felt it was quite easy to operate on this software interface. Moreover, it wasn’t filled with bloatware, but only the default apps for Gallery, Camera, QuickMemo+, Calendar and other tools like Backup and a folder to directly access the storage, apps, battery usage graph, and battery saving mode. We had a nice time using it, but the interface does need a lot of work concerning gesture features functionality. Despite it offers tap to wake up feature, there is no control option for it. I suggest a brand to take a look into this matter and roll out such update. 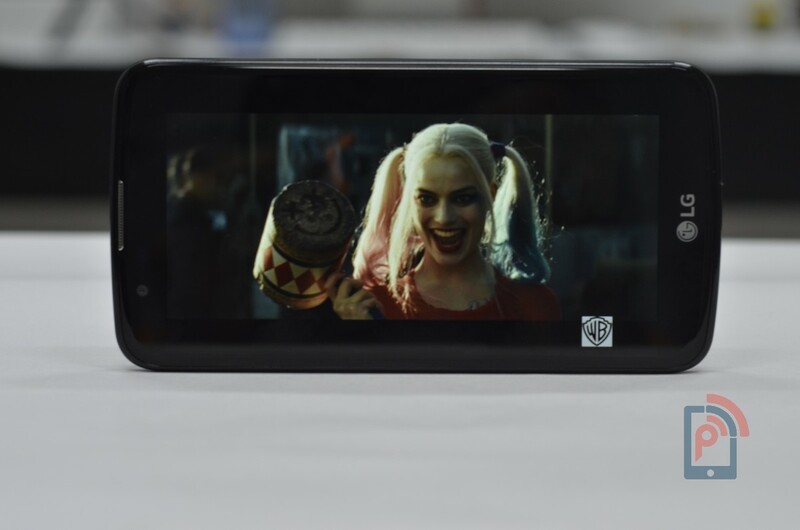 The device packs a Quad-core processor, which clocks at 1.2GHz, it’s a Qualcomm Snapdragon 410, and we are quite familiar with this processor. I mean it’s no powerhouse, but it’s been known to offer quite the performance. And it was no different on this handset. Though, at such pricing one expects at least SD 615 like a power house, minus the heating issues. It is paired with 2GB of RAM and 16GB of internal storage, which can be expanded up to 32GB via microSD card slot. Talking about the gaming experience on this handset, we noticed some lag, but nothing that you make your experience bad, considering it’s a 720p display, and you’re hoping to do a casual gaming. Because it is as best as you can hope a device with such hardware specifications. The RAM management on this handset is good as you’ll see around 1.3GB of free RAM most of the time when there are no recent apps running, but only background activities. The benchmark score for Antutu was at 28138 while Vellamo app resulted in scores of 1240 for Multicore, 907 for Metal and 2072 for Chrome Browser. The real browsing test revealed that it has a good Zoom-in and Zoom-out responsiveness. The camera package on this handset includes 13-megapixel image sensor on the rear, which is accompanied by the LED Flash. There are no fancy technologies like PDAF (Phase Detection Auto Focus) or Laser focus at play here. Maybe that’s why the focusing was such an issue here, adjusting angles is one thing, but the module demanded adjustment of lighting conditions for focusing. The camera app is neat and clean, and maybe too much as there weren’t much of modes to play around with. The Google Camera app has a lot to offer than LG’s default camera app. 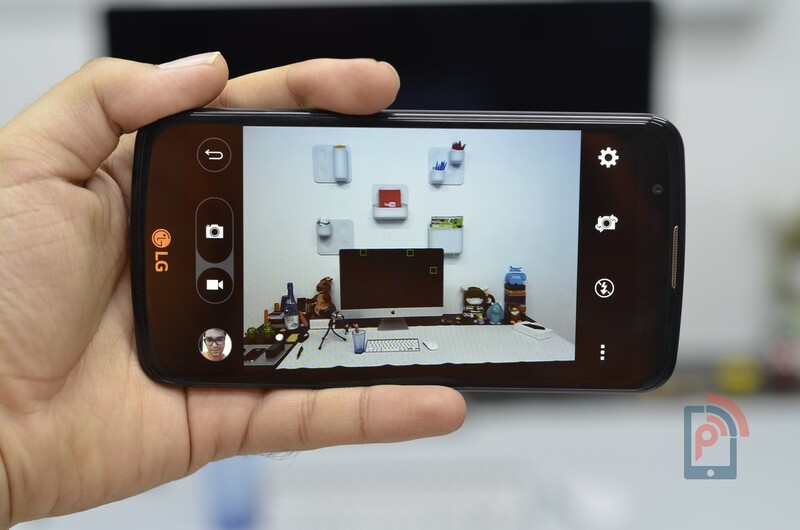 Though, LG camera app does have some gesture and speech features, such as using your palm to take selfies, or say to cheese to take captures. For those who like such functionalities, then you’ll enjoy it, but I wouldn’t want to take your hopes high, as the outputs weren’t as astonishing as one expects from a 13MP module these days. Even some 8MP modules have a lot to offer than the quality you get on this LG rear module. The highest resolution of video recording supported is of 1080p, but it the quality isn’t worth it. Moreover, there is no stabilization, optical or electronic present to stabilize the videography on this handset. Talking about the front-facing module, it has a 5-megapixel resolution camera that is used to take a selfie. Again, not the best 5MP module in the market in this price point, but it does a fine job. This is the biggest shocker on the K10, as it only packs a 2300mAh capacity battery, which is, to say the least, won’t be enough to last a day, even on average usage. And the same thing was resulted in our tests as well. You can stretch the juice to last till the end of the day, but if you’re using it a lot, then it won’t be giving you much screen on time at such low capacity. The company can optimize its OS for everything and SD 410 isn’t a power hogging chipset, and despite all that the battery won’t be enough. You have to understand that with a 5.3-inch display; the company had a lot of space to put a larger battery, not 3000, but at least 2700-2800mAh capacity. Talking about the connectivity, as the name suggests, the K10 LTE supports the 4G VoLTE network. Other Connectivity options include dual-SIM, Wi-Fi, Bluetooth, GPS and microUSB port. At a price of Rs 13,500 it isn’t the best device out there in the market, but for whoever relying on a big brand such as LG, this new handset is the best mid-ranger they have produced. It has got style, solid construction and a processor that can handle multitasking easily. But what it hasn’t got is the good camera package, display, interface and battery life. If you’re not the one who dwells into big brands, then you can purchase handsets from the likes of Xiaomi and LeEco as they have a good offering in that range.